Erosion is an ongoing process in all landscapes. Therefore, erosion and sediment control is an activity that all land managers have to manage. There are legal responsibilities to take all reasonable and practicable measures to minimise short and long-term soil erosion and minimise adverse effects of sediment transport. Adverse effects may include water quality and aquatic health issues, drainage and flow problems, damage to adjoining infrastructure and environments and increased clean-up costs. Erosion and sediment control (ESC) measures need to be in place on all construction site where exposed soils may arise. 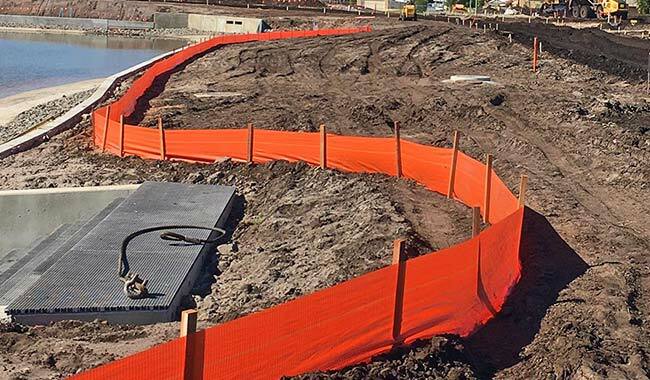 So what are some of the erosion and sediment control (ESC) measures that can be used for your construction site? Silt fence is a temporary sediment control device to contain coarse sediments runoff used on a variety of work sites. Made from a woven geotextile fabric it is installed with timber stakes or star pickets along the downhill side of the fence. The silt fence should create a barrier where runoff pools and allows water to flow through the fence while containing coarse sediments. 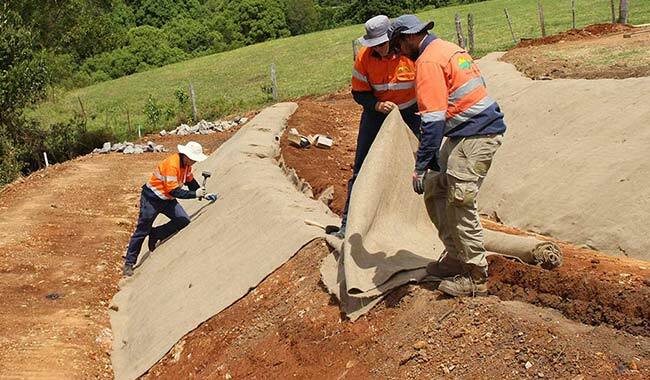 Aussie Environmental provide trench-less silt fence installation services for your site. 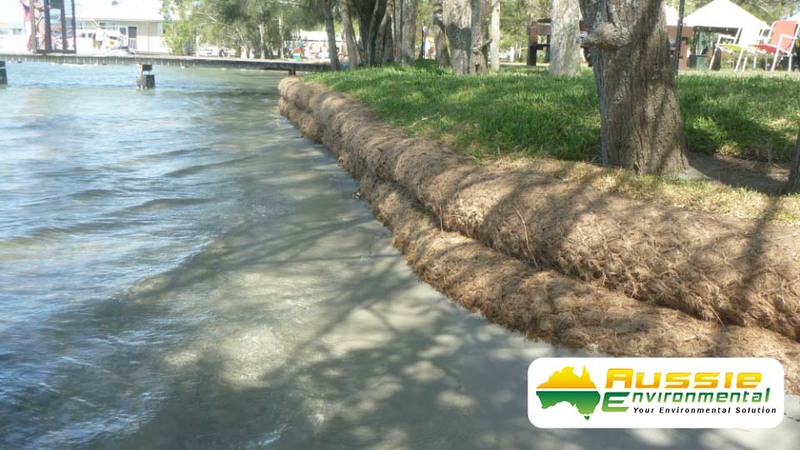 Erosion Control Blankets provide a protective barrier to disturbed soil until vegetation takes hold. They also provide temporary erosion protection by protecting against water and wind erosion, whilst promoting vegetation growth. 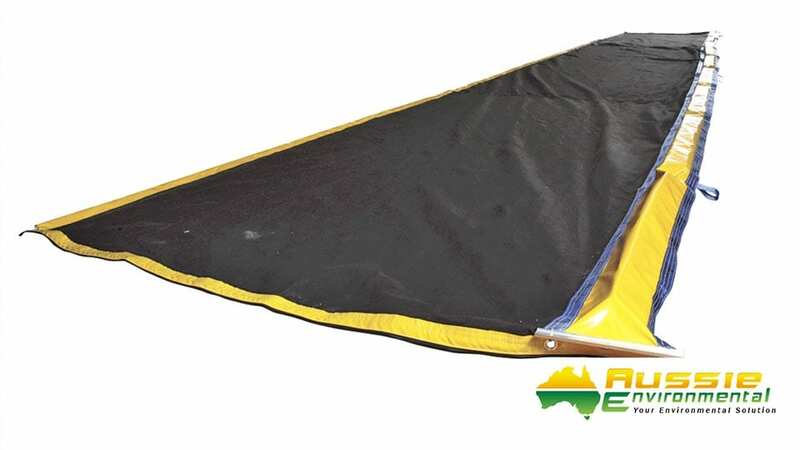 Erosion control blankets can either be a full blanket like material or come in a mesh like structure. These blankets and meshes are usually made out of natural materials such as coconut fibre and jute fibre. They can also be made from synthetic geotextile materials. Matting should be anchored to the ground using metal retaining pins sometimes called ground stables. On steep slopes 2-3 retaining pins should inserted every square metre. 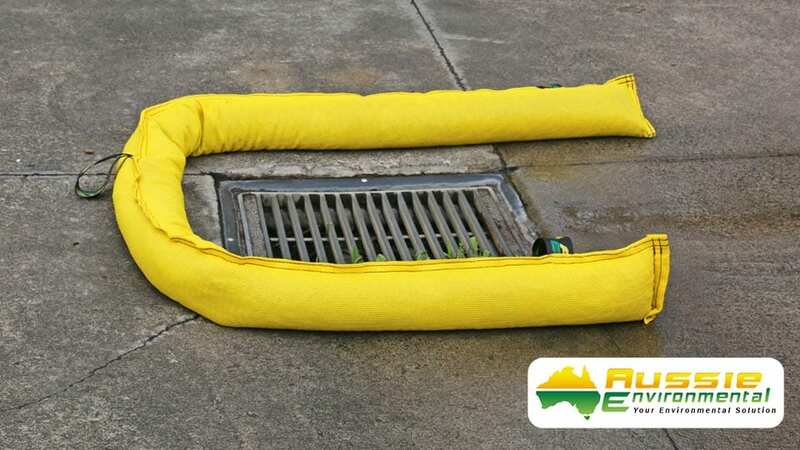 Aussie Environmental offers a wide variety of erosion control blanket and mesh products to suit your particular needs, to find out more see the links at the end of the blog. 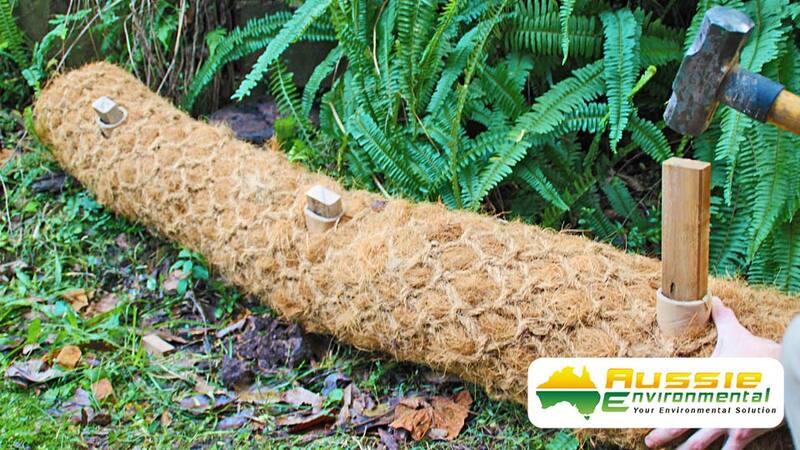 Coir Logs are a 100% biodegradable erosion control device made from coconut fibre. They are shaped like logs with an outer coir twine/rope netting that surrounds compacted coir fibre. Lightweight and easy to install they are ideal for constructing check structures, sediment control, managing changes in stream flow velocity, shaping channels and stabilising banks & shorelines. 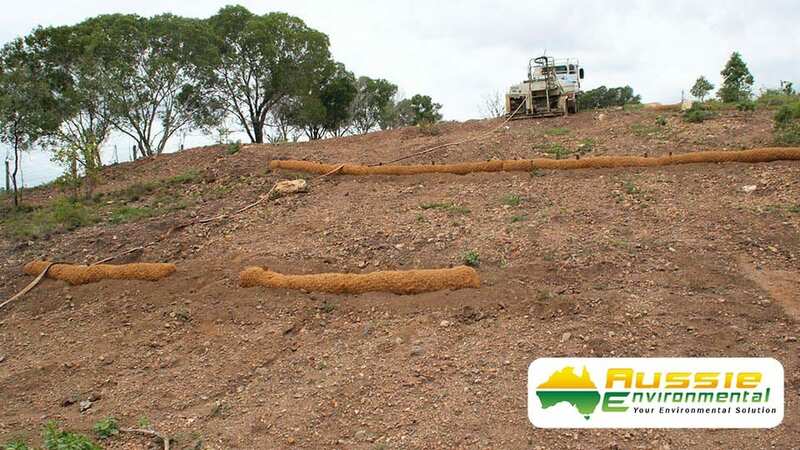 An environmentally friendly solution for bush regeneration projects, Coir Logs help retain soil, whilst providing a structure for vegetation to establish and take hold for long term stabilisation. Coir Logs are also an environmentally friendly alternative to hay bales. Hay bales not only break down quickly and are harder to manage, they are often contaminated with weed seed. 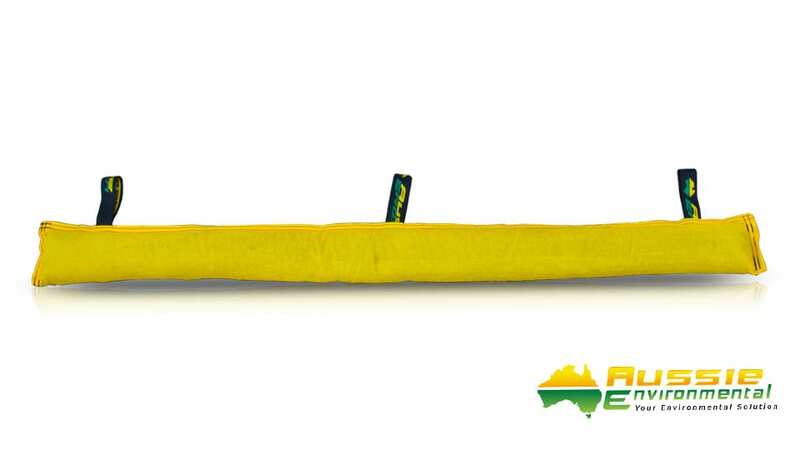 All Aussie Environmental’s coir logs feature pre-drilled holes for quicker and easier peg installation, with a life expectancy from 2-4 years. Hydromulching is used for erosion control/revegetation and is the mechanical application of seed, mulch, fertiliser, tackifier (sticking agent) and water to form a wet mixture called a slurry. These ingredients are combined and then pumped onto exposed soil to achieve grass coverage. Aussie Environmental can supply a range of seed mixes including standard seasonal seed mixes and native seed mix blends that are endemic to the area. Other soil amendments and growth stimulants can be added depending on end result sought and site conditions. We recommend a soil test be undertaken to achieve best results. Silt Curtains or Turbidity Curtain are floating marine barriers that sit in a body of water in aquatic systems to prevent silt and sediment from spreading. Silt Curtains are used for dredging, excavation, piling operations, rock walling and other aquatic construction activities. They are designed to contain suspended silt and sediment so that it can settle to the marine floor. Silt Curtain come in a variety of skirt lengths catering for varying water levels. 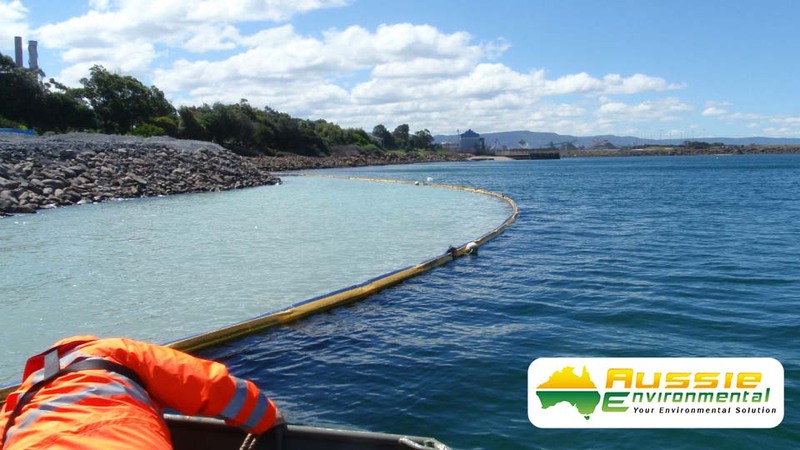 Aussie Environmental can supply and install a range of Marine and Waterways Protection products for your site including Silt Curtain (Turbidity Curtain), Aquatic Weed Boom, Fence Booms and Containment Booms. Dust generated from construction sites can cause major issues to surrounding properties, businesses and the environment. Aussie Environmental provide dust suppression and ground stabilisation using a cost-effective spray which creates a durable veneer coating over ground cover. Soil binder is an environmentally-friendly sprayed-on polymer which penetrates the top layer of the soil and forms a durable layer that bonds to the underlying surface. Our soil binding polymer supports revegetation and seed germination while protecting against soil erosion and maintaining dust control over long periods of time. Soil binding can be applied quickly and easily with little to no soil preparation required. Soil binding is a low maintenance erosion control application which keeps the soil in place. Unlike other sources of erosion control soil binder does not need continual maintenance saving you time and money. Silt Socks are made with a geotextile fabric and are commonly filled with rock or gravel to allow water to pass through whilst capturing the majority of coarse sediment. 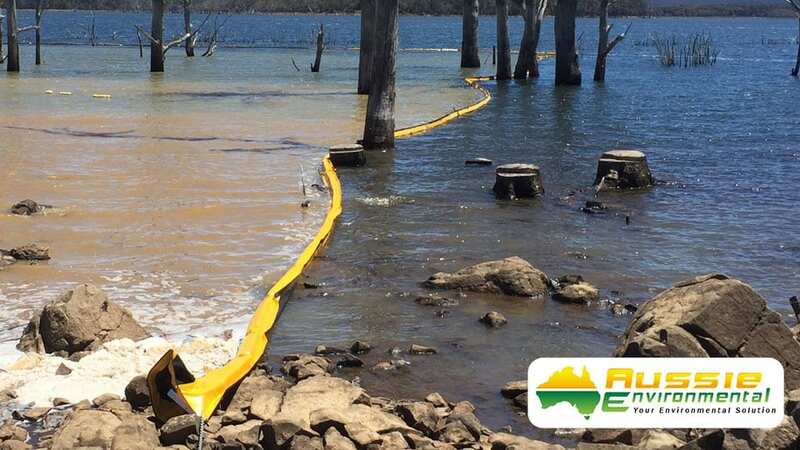 Aussie Environmental silt socks are available in a standard UV stabilised polypropylene, a heavy duty UV stabilised polypropylene, UV stabilised geofabric as well as a non-woven geotextile. 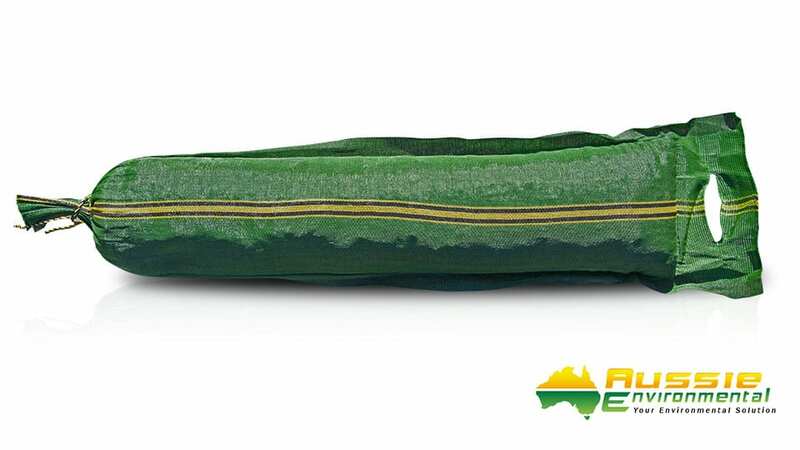 Aussie Environmental also supply heavy duty rubber filled silt socks, filled with recycled rubber enabling them to be reusable, easily transportable and driven over by vehicles. 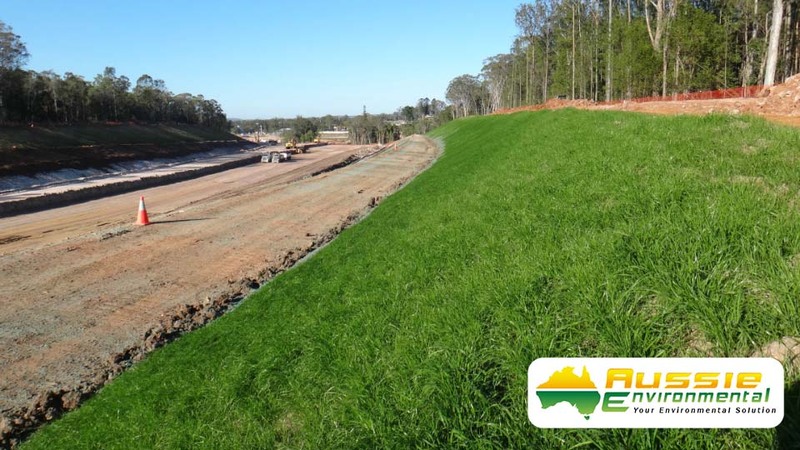 Aussie Environmental can provide realistic solutions on implementing a range of erosion and sediment control (ESC) measures so you can manage your site and minimise (or totally remove) your impact on waterways and the wider environment. 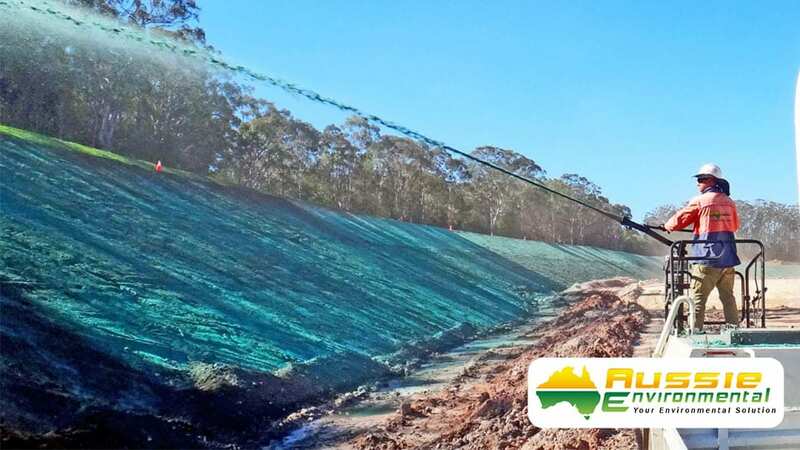 Aussie Environmental provide a range of services including: silt fence installation, hydromulching (hydroseeding), erosion control blanket installation, dust suppression, silt curtain installation and much more.